A high gloss dining table on a V-shaped base instead of classic four legs looks very impressive in any modern room. Moreover, a base like this seems to visually occupy less space, which is great for a small room. Creating a feeling of open space, these glossy models cheer up a modern dining room. Homeowners who are fond of unusual solutions will definitely appreciate unexpected material blends. A combination of genuine wood and high gloss finish is one of the most memorable ones, and even though these finishes might seem incompatible on the first glance, they look astonishing in mixed style modern rooms. One of the most rich looking dining table designs is a tempered glass surface on a stone or marble base. Note, though, that a solution as eye catching as that is more suitable for a spacious room. In a compact room, a tempered glass surface on a wooden, chrome, or high gloss base — basically, any base instead of a marble one — will help to visually optimise your available space and make the room a bit larger. And, if you go with black tinted glass and light dining room walls, the room will look much more spacious than it really is. Another way to make the dining set look time relevant is to mix match dining chairs. Some of the latest dining set designs even have a mix of chairs and benches by default — a very sweet and unusual solution that can cheer up any dining area. Another example of latest designs of dining tables that are growing increasingly popular are rustic tables. 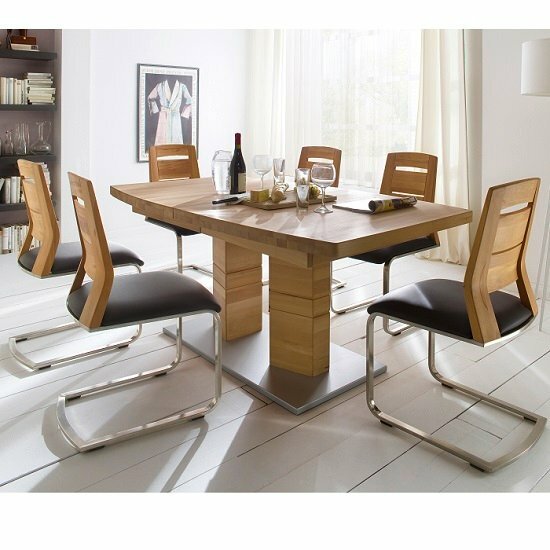 Giving any dining area a welcoming look, rustic tables are also incredibly durable models, designed to last. Homeowners who are fond of classics will enjoy the loud return of genuine wood furniture. Cosy and domestic, wooden tables fit in any decoration theme, making the room feel like home. And finally, consider going with French cottage style for a touch of retro in your home. White French furniture, despite its vintage design, still looks time relevant in traditional rooms.